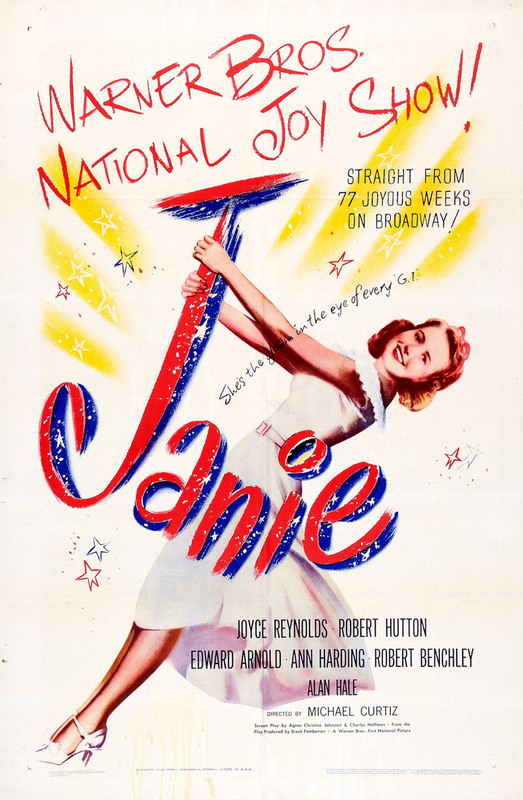 Janie is a charming wartime domestic comedy released by Warner Bros. at the height of the post-Normandy push in the autumn of 1944. After a successful run on Broadway, Jack Warner secured the project and assigned Michael Curtiz to direct newcomer Joyce Reynolds in the title role. Essentially an ensemble piece, it boasts a strong Hollywood cast (not a single Broadway holdover) featuring Robert Hutton, Edward Arnold, Ann Harding, Alan Hale, and Hattie McDaniel in key roles. 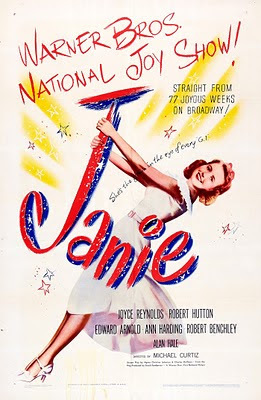 Judging by the poster, the studio clearly marketed the film on the strength of the stage production, and as an effort to make a star out of the nineteen year-old Reynolds. Here’s it is in a sentence or two: Janie Conway (Reynolds) is a small town girl whose hormones kick into overdrive when the army moves into her hometown of Hortonville, much to the consternation of her overbearing father (Arnold), who runs the local newspaper. Pretty soon Janie is juggling a newfound army beau (Hutton) and her high school sweetheart, both of whom want to knock the other’s block off. Everything wraps up Risky Business style, when the Janie and her girlfriends throw a big party for all the under-twenties from the army base at the Conway house. In spite of the fact that this is a low-budget film targeted at teens, it has a great script and a particularly strong narrative construction, with numerous subplots that all wrap up nicely at the end. It embraces teen culture during, the generation gap, frustration with the bureaucracy of the war years, young love, old love, the marriage boom, self-sacrifice, and so forth — but manages to handle all of its subject matter with a good sense of humor. Curtiz’s direction is highly accomplished: he wrestles good performances from his young cast members, and allows the veterans to do their thing; the whole thing moves at breakneck speed, but the pacing of the comedic moments is perfectly handled and the film never loses its light touch — especially important in 1944. With that in mind, it’s also important to note that while Janie has its sentimental, patriotic moments, it never feels heavy-handed or too much like rah-rah propaganda. Instead, the movie takes a more subtle approach, presenting a picture of the kind of idealized American family and Rockwellian small town life that the country’s young soldiers were supposed to be fighting for — whether it existed only on a Hollywood sound stage or not. It goes without saying that the characters are unrealistic — all the girls are pure as the driven snow, while the boys from the base couldn’t be more well mannered. Most of this will be irrelevant to viewers looking for a pleasantly diverting comedy film, which Janie certainly is — even more so than other, better known films. This thing qualifies as a forgotten gem. 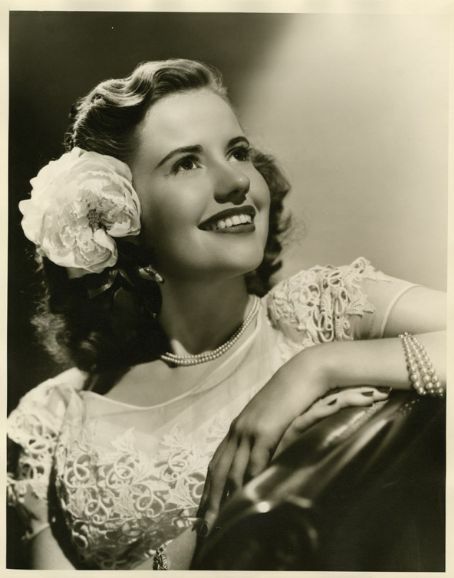 Reynolds looks so much like Deanna Durbin that they could be sisters, and the whole movie has the feeling of a Durbin project. There’s even a musical number that happens during the party sequence, when all of the young people sing an impromptu rendition of Jules Styne and Sammy Cahn’s Keep Your Powder Dry (one year later the title of a Lana Turner picture). It’s an extended sequence that really swings; but while for me it was a highlight, the way in which everyone in the party takes a turn at the lyrics might damage the film’s sense of continuity for some viewers. And while Janie was a long-sought-after viewing for me (this is the only Academy Award nominee in the film editing category that I hadn’t seen), other who happen upon the movie are almost certain to enjoy it. 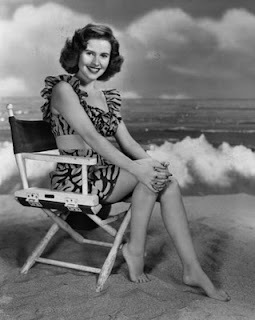 It was successful enough that WB produced a 1946 sequel with Joan Leslie in the Reynolds part. Reynolds herself would only make three more films after Janie, two of them opposite Hutton, and would leave the business in 1950.